As someone who has naturally straight hair, I’ve always envied wavy, voluminous locks. With straight hair, there comes sacrifice in the form of not being able to hold a curl. I’ve gone through dozens of styling products that claim to give grip and hold to my hair. I have bought various curling wands from stores like Target and Sephora. Nothing seemed to work for me, until now! I wanted to share the products and curling wand I use because I think a lot of hair styling has to do with the way you prep your hair! Alterna Bamboo Volume 48 Hour Sustainable Volume Spray, $25. Tresemme Thermal Creations Heat Tamer Spray, $5.49. Batiste Hint of Color Dry Shampoo, $8.99. Not Your Mother’s Beach Babe Texturizing Sea Salt Spray, $6.19. L’Oreal Elnett Satin Extra Strong Hold Unscented Hairspray, $14.99. Wigo Color Teasing Boar Bristle Brush, $3.99. Tangle Teezer, $15. Conair Infiniti Curling Wand Styler, $19.99. To begin, I take my Alterna Bamboo 48 Hour Sustainable Volume Spray and distribute the product evenly through my hair. I like to do this step when my hair is still damp from washing so I can blow dry for extra volume. To begin curling, I section my hair into thirds and start with the lower third section. I could best describe this as my hair that’s beneath the bottom of my ear. Next, I take my curling wand and begin on my left side. When working on this side, I curl all of the pieces in the same direction and away from my face. I personally like the hair to face outwards, rather than inwards, but feel free to curl in the direction you most prefer. I repeat this step on the right side and obviously switch up the direction in order to continue curling away from my face. Lately I have been leaving out an inch of hair at the end of my curl to make my hair look longer and also give an overall beachy, undone vibe to my look. Next, I repeat the curling steps on the middle third section and the upper third section of my hair. It is tempting to not brush out your curls at this step, but try to let them set for at least 10 minutes to ensure longevity in your style. Once cooled, I take my Tangle Teezer and gently brush out the tight curls. Lastly, I tease the top of my hair with my Wigo Color Teasing Boar Bristle Brush. A step I like to do to give my hair more volume is to use Batiste Hint of Color Dry Shampoo and spray directly at the teased roots. I then use my Not Your Mother’s Beach Babe Texturizing Sea Salt Spray all over my hair and scrunch it in. This will provide great texture if you have straight and thin hair, like me! After the sea salt spray has set, I use my L’Oreal Elnett Satin Extra Strong Hold Unscented Hairspray to lock in the whole look. This hairspray is amazing! If you do not enjoy the crunchy look of hairspray, you will really enjoy this particular formula. Just make sure to get the unscented because the original one smells terrible! Yay for the final product! If you haven’t heard already, there’s an incredible, affordable, online beauty company called ColourPop! They are quickly growing to become one of my favorite brands because of their weirdly reasonable prices. ColourPop has constant new product releases that feature very high quality eyeshadows, eyeliners, blushes, bronzers, highlights and lipsticks! I decided to share my favorite eyeshadows with you because I think they are universally flattering shades and would look great for any natural or glam look! Also they’re only $5 so…you need them. 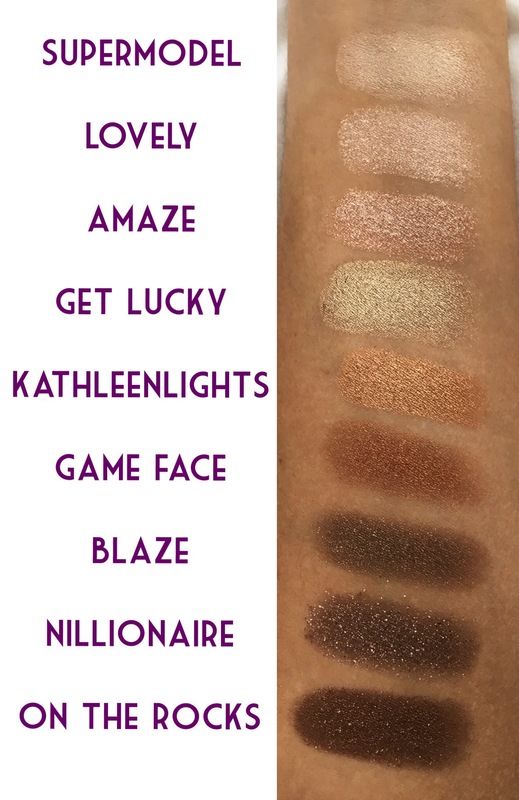 On The Rocks, Nillionaire, Blaze, Game Face, KathleenLights, Get Lucky, Amaze, Lovely, Supermodel. Each eyeshadow is only $5! Their eyeshadows come in a range of shades. You can find both neutral and bright colors that come in a variety of finishes. 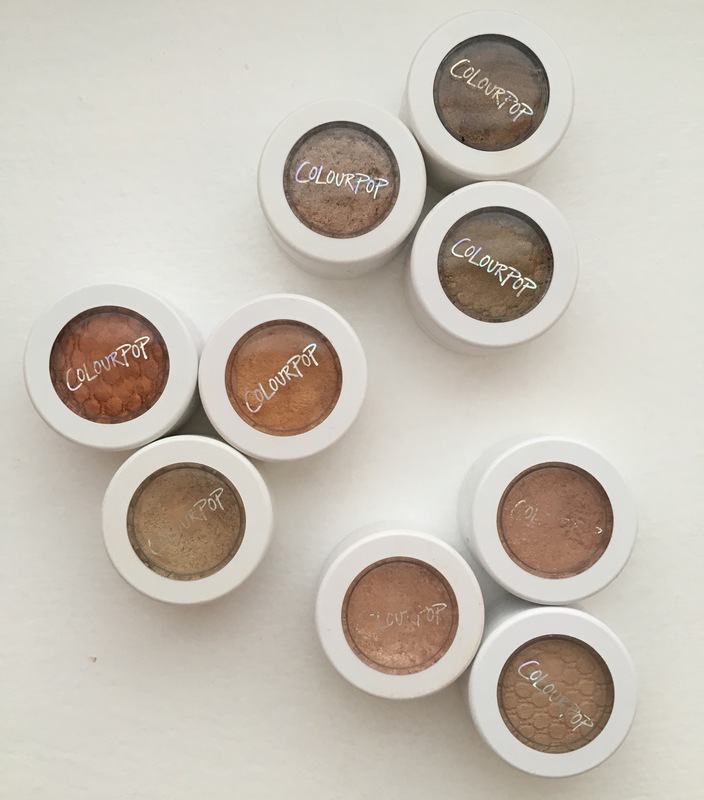 On their website, ColourPop categorizes their eyeshadows as either Glitter, Sheer, Satin, Matte, Metallic, Ultra-Metalic, Pearlized and Pressed Pigment. My personal favorite finishes are Metallic and Pearlized because they sparkle and bring attention to the eye area. They aren’t as “in-your-face” as a typical glitter pigment, but do give a more unique, noticeable glow to your lids. You can also shop by shade if you have a general color family you enjoy sticking to. The texture of these eyeshadows are extremely unique, I can best describe them as a very mousey, cream-to-powder formula. It is also important to close the lids on all ColourPop products very tightly because if they dry out, they will lose their smooth texture and pigmentation. When applying these eyeshadows, I recommend using a primer underneath to reach maximum color payoff and longevity. My favorite is the Urban Decay Primer in the shade Eden. Also they do apply more smoothly and pigmented by using a light patting motion with your finger, rather than a standard eyeshadow brush. With flash and individual shade names! There are so many good things I could say about these eyeshadows! I get so many compliments whenever I wear them and wanted to share the colors I think you need to build your collection! Based on the shades chosen, I’m sure you can see I enjoy warm-toned neutral colors. However, there are plenty of beautiful, cool-toned eyeshadows to choose from too. Let me know if you decide to purchase any of these shadows and which shades you picked! Also if you want to see more reviews on other ColourPop products, leave a comment below and I will put them to the test! For this look, I used Supermodel on the inner corner, with Lovely all over the lid. I then blended KathleenLights on the middle part of my lid. For the outer crease, I blended On The Rocks and made sure the colors faded seamlessly together.